Our one-page handout containing the poem For the fallen with a photograph and very basic information about its author, Laurence Binyon. Our one-page handout containing the Ode with a photograph and very basic information about its author, Laurence Binyon. The Ode (from For the fallen, by Laurence Binyon) is commonly read as a component of ceremonies on Anzac Day (and Remembrance Day). This web page comments on the past controversy (in Australia only) over whether the words at the end of the Ode's second line are "the years condemn" or "the years contemn". It is now generally accepted that "the years condemn" is the correct expression. This 45-page document opens at page 38 for the Ode and its background. Our one-page handout containing the poem In Flanders fields with a photograph and very basic information about its author, John McCrae. Professor Moina Michael was inspired by John McCrae's poem In Flanders Fields and wrote her poem in response to it. She is known as the "Poppy lady" for her idea of selling poppies to raise funds for returned service personnel. Our one-page handout containing the poem We shall keep the faith with a photograph and very basic information about its author, Moina Michael. [Archive: may load slowly.] Seven poems written by Gallipoli soldiers: five by Leon Gellert from Adelaide, one by Edward Harrington and one by R.J. Godfrey. Gallipoli, a poem written by NSW-born Staff Sergeant Sydney Bolitho while serving at Gallipoli in 1915. 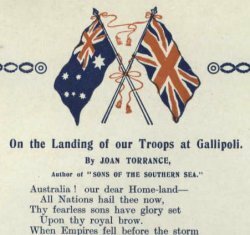 There are many poems written by Gallipoli soldiers in The Anzac Book, although some would be inappropriate for Anzac Day commemorations. An archived version of The Anzac Book is available. See our Early books page for more information. 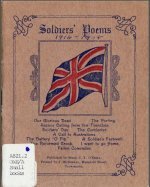 A book of 11 poems written by Sergeant Charles Townsend O'Neill and apparently published in 1919. - Note that instead of using the very large (62 megabytes) pdf download link (called "Soldiers poems") near the bottom of the web page, you can instead use this 4 megabytes version of Soldiers' Poems [pdf]. - Note also the expression of doubt about Charles O'Neill being the author of all of the poems. - Additional information (State Library of Queensland) makes it clear that C.T. O'Neill's full name is Charles Townsend O'Neill. 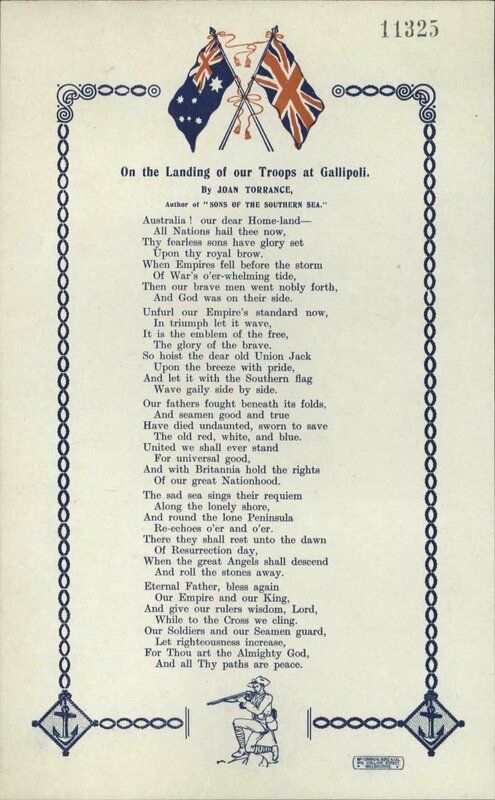 This poem written by Joan Torrance in 1923 conveys to the world that the bravery of Australian soldiers at Gallipoli had turned Australia into a nation that could hold its head high. - If the National Archives of Australia copy is unavailable, you can download a one-page pdf file or a jpg image of the poem. A poem written by Rupert McCall for Anzac Day 2005. Reproduced by the Brisbane Times in 2008 as Ninety-three years ago. 16 poems for possible use in memorial services, or "just to assist in understanding what ANZAC Day is all about." However, many more poems about the Anzacs and Australia's participation in World War 1 are provided.